I’m still in New Orleans, but ALA is over. Many of the librarians, et al, have packed up and gone home. The Mister and I have one more day to enjoy together before we both get on planes going to different places. I find myself unable to make up my mind as to what I should do with this last day. I have a couple of souvenirs to pick up and a box of books to ship home. We should probably eat something. But right now we are just sitting companionably in our artfully messy hotel room listening to the St. Charles street car go by every 10 minutes. I have been to conferences before, even ALA. In fact, I have been to dental conferences (don’t ask). This is the first conference where it really clicked why I am here. The sessions were good–I learned a lot about the future of digital media (ebooks, music, etc. ), cloud computing, databases, and most importantly, myself. I talked to people I didn’t know and gave them ideas from our system that they will take away and use to make their school library more interactive with students. I learned from them too, in many ways. Mostly I learned that my system is amazing, that we do a lot, even if we librarians sometimes feel that we, as a system, don’t take that first innovative step until someone else has tested the field. There are a lot of places where we are the front runners in public libraries. The panel I moderated went amazingly well. Forty people came, which was great since it was in the very last time slot for presentations at the conference and that’s about what the room could hold comfortably. There was a good representation of academic and public libraries in the audience and many of them had zine collections. Our panelists, Jenna Freedman, Chris Ritzo and John Stevens made for a well rounded presentation. Jenna is a librarian at Bernard College, which has an extensive zine collection. Chris is a volunteer librarian at the Urbana Champaign Independant Media Center. And John is at the State Library in Melbourne Austrailia, where zines are archived for the future. Both John and Jenna have their own zines in addition to helping preserve them. All three are very active in the zine culture in their areas, as well as in their professional pursuits. Once again, I am not going to tell you about what I am reading now because I wouldn’t do it justice under all this conference talk. I’ll have a special book review edition after I return home. I’m here in New Orleans and enjoying myself immensely. 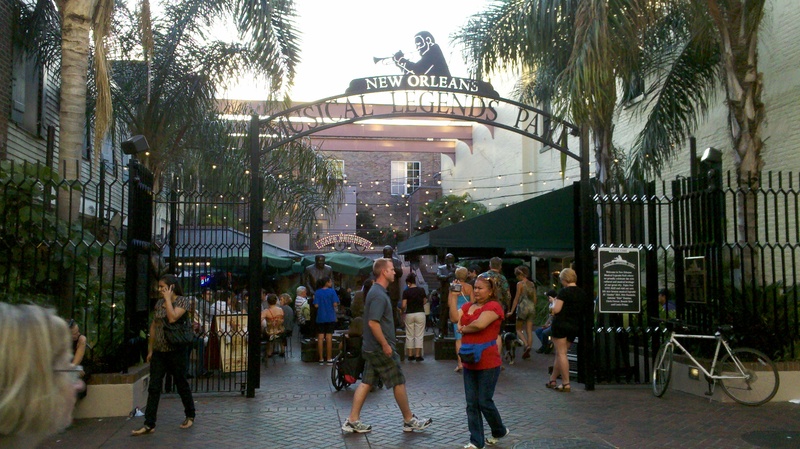 The Mister and I have walked all over the French Quarter, checked out the River Walk and tasted some mighty fine gumbo. We’ve given up on finding a grocery in walking distance, but I found a farmers market this morning and we got some peaches. I seriously need fresh fruit or the gummy bear addiction goes into overdrive. Yesterday I volunteered with NOLA School Volunteers through ALA’s Libraries Build Communities. We helped paint a school room at a local high school. Pictures above. Also pictured is a promotional postcard for a galley I am looking forward to reading. I met Jessica today in the exhibit hall and we had a great conversation about incarcerated youth and she offered to skype with my new mentee’s home. I hope to take her up on it. I’ll fill you in on What I am Reading when I am back at the computer. I made it to vacation and I (think I) even got everything done. Tomorrow we leave for camping on the Olympic Peninsula, which almost guarantees that it will be raining. I am sad that the Boy can’t come, but he has basketball camp starting on Sunday, and besides it is Father’s day weekend and I am sure he wants to spend it with his dad. Hopefully I will have a signal so I can call and harass him every night. I’ll post some pics here too if I can. I have been wading through ALA related email, trying to decide what programs to go to. A few have been added and I know I won’t really make up my mind until I get there and see where everything is. If the sessions are across town, it’s not as likely I am going to make it. Being the geek that I am, I reread that last paragraph and had to look up if it was bad grammar to end a sentence (or in this case, several) with a preposition. Evidently not, although it is not recommended for long sentences where the preposition can end up far from its object, confusing the reader. What am I reading? Finally in the last chapter of Fevre Dream. I have to admit I am getting tired. But I really want to know what happens! Tonight for sure. Also still on The Jewel and the Key, and typing that I just realized what the title refers to. I can be a little slow. I still get a little frustrated with the Seattle references, but I am starting to move beyond it to enjoy the story and the writing. Spiegler does a really nice job with description and substance, although I feel the character development is a little lacking at this point. Wow, the two weeks since vacation have been crazy pants. I don’t know how I packed so many obligations into such a short amount of time, but I figured out yesterday just how much I had booked. 2 computer classes (one of them my first day back), 1 TAG wrap up party, 1 TAG video edit (coming soon), 2 training sessions, 1 school visit (with 7 classrooms and a lunch table), 1 scavenger hunt program–throw in a weekend Union conference, a general membership meeting and a few personal things–The Boy’s basketball tournament in La Connor!–and I’ve been one busy woman! Of course, there are upsides and downsides to this kind of thing. I got to do everything I wanted (everything! ), and I get the second half of the month off for vacation and ALA. The downsides are that I had to drive most days because of supplies and early mornings, I woke up at odd times from anxiety dreams, and I was a little high strung. Usually I don’t plan things so close, but a few weren’t my doing (training) and the others couldn’t be helped (without making the choice not to do them). I had time for them all and planned really well, so they all came off without a hitch (except for Facebook class, but I blame Facebook’s ever shifting craziness for most of that). 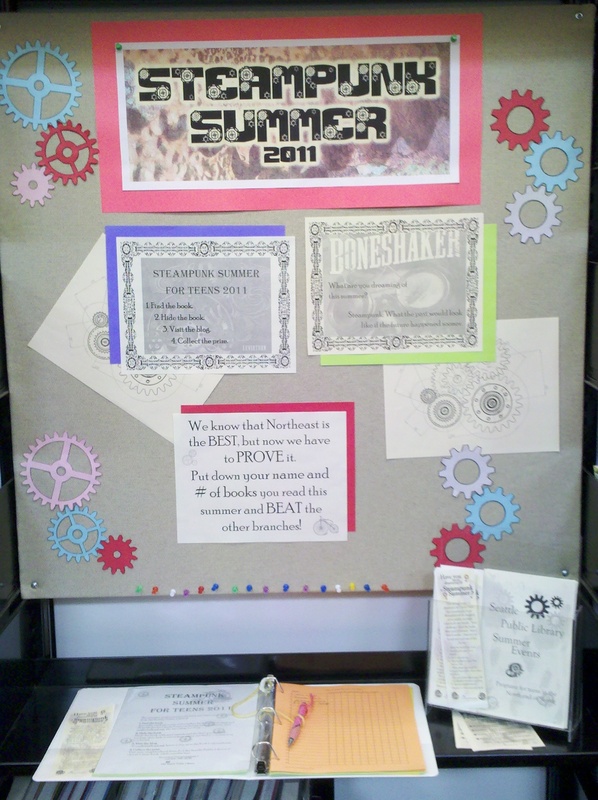 I put the finishing touches on my Steampunk Summer display last night after the Scavenger Hunt and I like the way it turned out. I talked up the teen summer reading program to teens at the local middle and high school and they seem pretty excited about it. All of my hidden books disappeared pretty quickly and coworkers said that kids came in asking about it. (Click the link above for more info about Steampunk Summer). What am I reading? Still finishing up Fevre Dream by George RR Martin. That books is long–but worth it, as Martin books are. 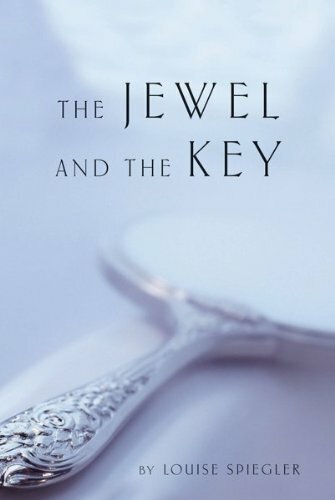 I just started an ARC that a local author gave me; The Jewel and the Key by Louise Spiegler. She’s a history teacher and also wrote The Amethyst Road. I like it so far, but I find that books set in Seattle unnerve me a bit. Usually they use landmarks I know, but mix up their locations to fit the story. I find myself wanting to look up every location on a map, which is distracting, but not the author’s fault. The first scene of The Jewel and the Key is at Lincoln High School, which is a real place, but has not functioned as it’s own high school for a long time. It is currently being used to house other schools while their school is undergoing renovation. Right now, I think there are two elementary schools using the site. Lincoln is in Wallingford, so every time the character turns a corner, I try to envision where she is. I used to work in that ‘hood and know it fairly well. I’m going to have to let this go to enjoy the story. So far the writing is good and the characters are interesting. More later. 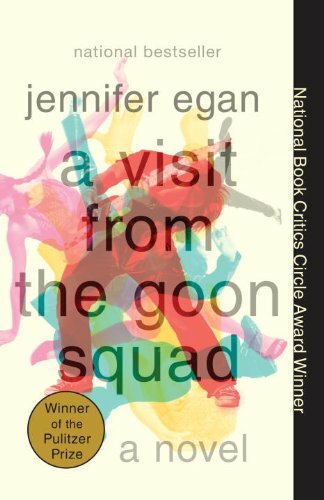 I finished A Visit From the Goon Squad by Jennifer Egan–very contemporary. I liked this book, but I’m not sure I loved it. I felt like I was reading several related short stories that eventually came together in one conclusion. I liked each of these individually–even (or maybe especially) the one done in power point slides–but overall it felt choppy and hard to follow. I did enjoy the characters; meeting each one, discovering their strengths and weaknesses and following them on their journeys. Egan creates a very in depth picture of each of her characters, and they are very interesting.